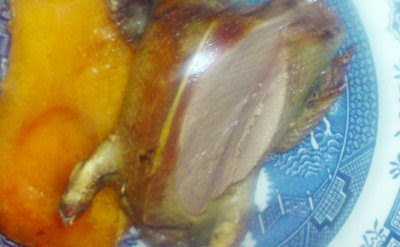 Rabbit Stew: Wood Pigeon stuffed with Rabbit innards! I managed to shoot both a woody and a rabbit last night (for the first time) so I decided I'd try and roast the pigeon with a 'stuffing' of rabbit offal. It sounds grim but was actually a delight, a real surprise. I gutted the pigeon - I'd plucked it in the field and removed the crop already - chopped up a few spring onions, did nothing to the rabbit innards - liver, heart, kidneys - other than separate the wings of the liver from one another (obviously having removed the gall bladder while I was gutting the rabbit) and then mixed them with the spring onions; I dribbled a little olive oil on the mixture with a bit of salt and pepper and then stuffed them in the pigeon. I wrapped the bird in foil - after giving it a dribble of the oil plus seasoning too - and then roasted it at 250 degrees centigrade for about forty minutes. I ended up doing this in my microwave oven (set to convection only) since my proper oven had decided to pack up last night. I've cooked pigeon breasts before - mainly grilling and frying them - but roasting the whole bird does seem to produce a better flavour. The rabbit innards were done to a turn and I scoffed the lot with a re-heated butternut squash I had left over from the day before. A really enjoyable meal! Sounds like a fine meal, indeed. Enjoyed watching the Morris dancers in the previous post.